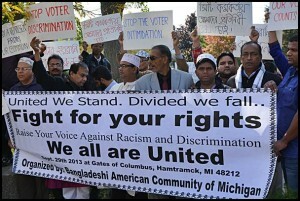 Members of the Bangladeshi and Yemeni community protested in Zussman Park after three Bengali men were charged with illegally handling absentee ballots. Criminal prosecution against four Hamtramck men charged with illegally handling absentee ballots last year has been postponed. Armani Asad, 33, Salim Ahmed, 50, Russell Mohammed, 32 and Mohammed Abdur Rahman, 61, who face felony charges, had been scheduled to begin their trial on Thursday (May 1) in front of Wayne County Circuit Court Judge Timothy Kenny. At the time The Review went to press, there was no new date scheduled. Asad, Ahmed and Mohammed are charged with illegally delivering a total of 41 absentee ballots for the August Primary Election. Rahman is charged with illegally handling six ballots during the November General Election. Originally the first three defendants were heading toward a plea deal, but apparently they ended up rejecting the offer. The state Attorney General’s Office initially was not going to prosecute Rahman, but after the plea deal for the original three fell through he was charged a couple of weeks ago. The cases are a curiosity in Hamtramck’s often stormy elections. There have been numerous accusations in past elections of candidates’ residency status, ballot tampering and miscounts, but a matter of mishandling AV ballots has not come up in recent memory. One reason that the use and handling of absentee ballots has become an issue in recent elections is that the Bangladeshi community has increasingly voted by this method. All four defendants are Bangladeshi-Americans. What the defendants are charged with is turning in absentee ballots not belonging to their immediate family members or someone living in their household. It may seem like an obscure rule, but City Clerk August Gitschlag has pointed out that it’s printed in three separate places on the packing that comes with absentee ballots. None of the ballots in question were thrown out, and they were all counted in their respective elections. 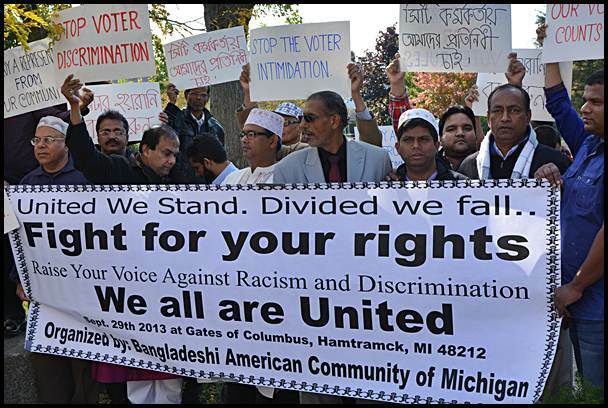 The charges drew protests from the Bangladeshi community, which has become the biggest voting bloc in Hamtramck as that community continues to grow and become more politically active. After the first charges were filed about 100 protestors from the Bangladeshi community massed across from city hall in Zussman Park. Many held up signs, some accusing the city of voter intimidation. “Many are not aware of the proper handling of absentee ballots which has led to recent charges being filed against members of the community,” they said. If convicted the defendants face a maximum sentence of five years in prison and a $1,000 fine.